Himalayan pattern in seal, blue, chocolate, and lilac point. Short, fine-textured, glossy; lying close to body. 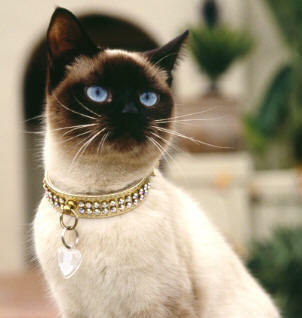 The Siamese is a medium sized cat with a long, lithe body that is graceful and elegant but still has a muscular feel. They should feel much heavier than they appear. The body is well balanced and athletic. The hind legs are higher than the front. The legs are slender and the paws are small and oval. The head viewed face on resembles a triangle tapering in straight lines to a fine muzzle. The profile should be straight with no breaks or stops and the chin is deep and strong. The head is carried on an elegant neck. The ears are large and pricked and are set so that they follow the lines of the triangle. The eyes are oriental in shape and slant towards the nose. There should be width between the eyes and they should not be deep set. The tail is long and tapering and free from kinks. Some cats seem to think that a purr or a friendly rub speaks louder than words. Siamese are not of this school of thought and are known for their talent for communicating their ideas and desires clearly to their chosen humans. If you can?t be drawn into dialogue, they?re happy to keep up a running monologue for your enlightenment. No meaningless meows, these, but real attempts at communication, according to Siamese fans. To some cat lovers, who prefer their felines to be seen and not heard, the Siamese rasp (some would say yowl) can be a bit annoying. But Siamese worshipers wouldn?t have it any other way. Siamese need very little grooming. Their "painted on" coats are very short and close-lying with no noticeable undercoat. Their favorite grooming tool is your hand, applied gently down their backs.